Since bigotry and fearmongering continue to be a winning political strategy in US elections, it’s not a surprise that many candidates during this off-year cycle have cashed in on anti-immigrant, racist rhetoric and campaign imagery. It is worth noting, though, as the 2017 elections wrap up, how blatantly obvious and revolting this messaging was in many races. 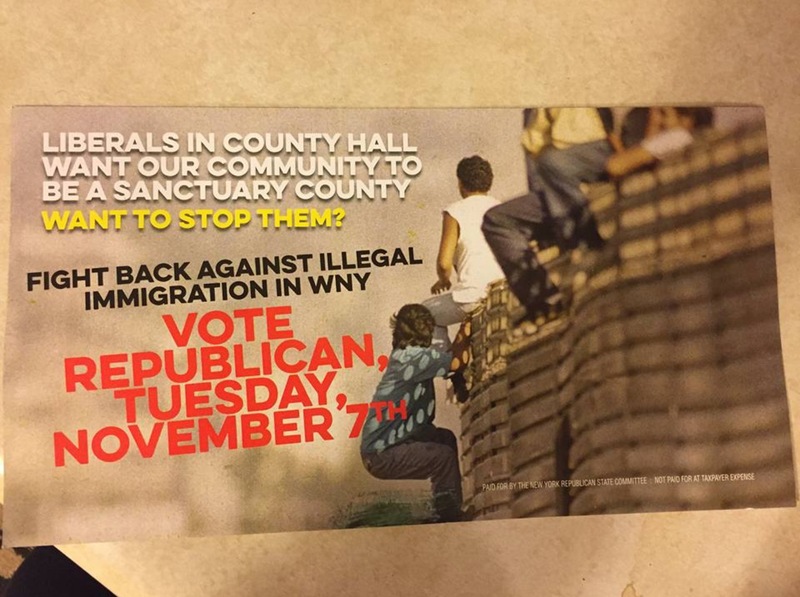 In Erie County, New York, the New York State Republican State Committee whipped up xenophobia by falsely claiming “liberals” wanted to turn the county in a sanctuary for undocumented immigrants. Image Credit: Matt McDermott via Twitter. In Nassau County in New York’s Long Island, the Republican Committee sent out mailers claiming that a vote for Democrat Laura Curran for county executive was an enthusiastic vote for “illegal immigrants” and violent gangs. 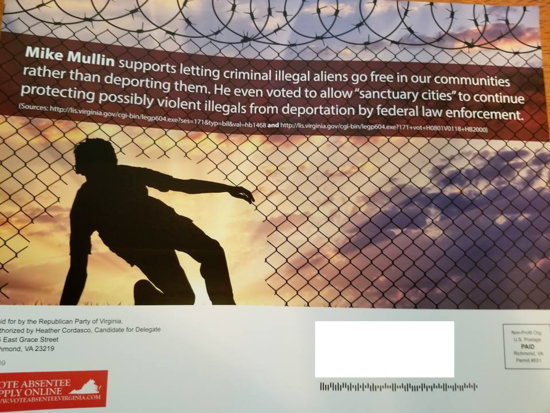 Similarly, the Republican candidate for the Virginia House of Delegates District 93, Heather Cordasco, sent out mailers to voters claiming her opponent, Mike Mullin, supported setting up sanctuary cities where violent immigrant criminals could roam freely and apparently dissolve chain link fences with their evil powers. 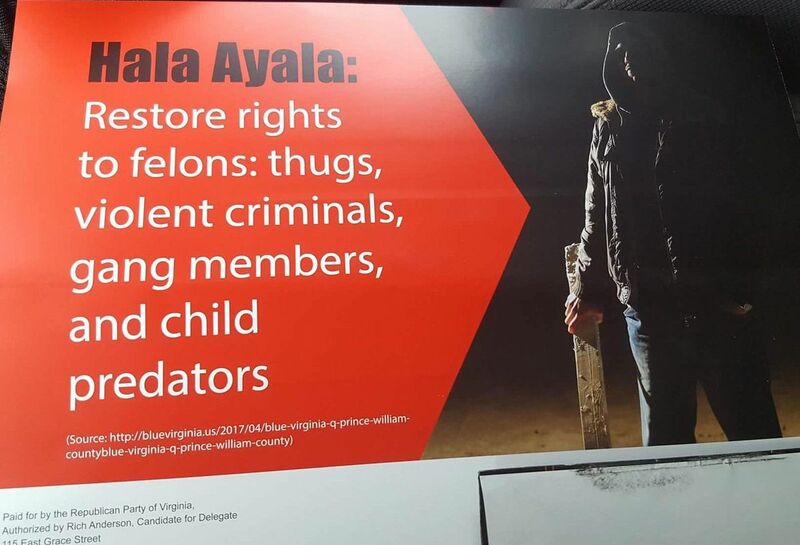 Again in Virginia’s House of Delegates race, the Republican candidate for District 51, Rich Anderson, scared voters with the claim that his opponent Hala Ayala wanted to “restore rights” to violent criminals and pedophiles. The accusation perhaps stems from a perversion of Ayala’s support for Gov. Terry McAuliffe’s ongoing policy to restore voting rights to Virginians with felony convictions who have completed their sentences. Virginia’s politicians continued to outdo themselves with the racist campaigning this season. 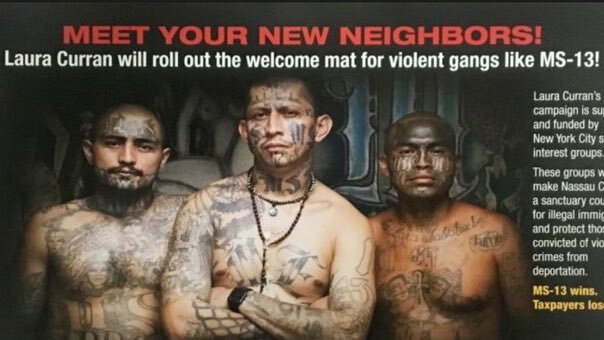 This attack ad by Republican gubernatorial candidate Ed Gillespie again raised the specter of “sanctuary cities” and accused opponent Ralph Northam of advocating for a haven for bloodthirsty Latino gang members. And Virginia wins this year’s racist Olympics! 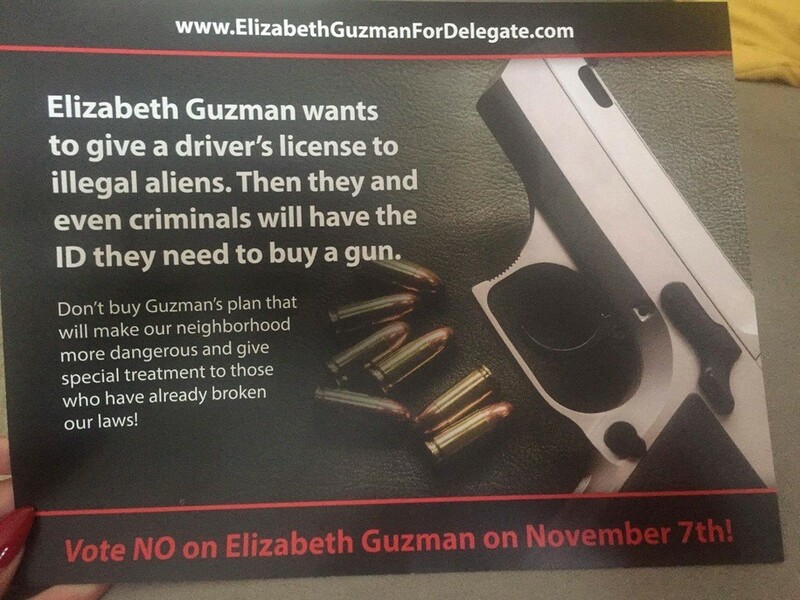 In the District 31 House of Delegates race, a Republican PAC paid for these mailers accusing Democratic Party candidate Elizabeth Guzman of making it easy for “illegal aliens” to buy guns (as if Republicans cared about limiting access to guns!). 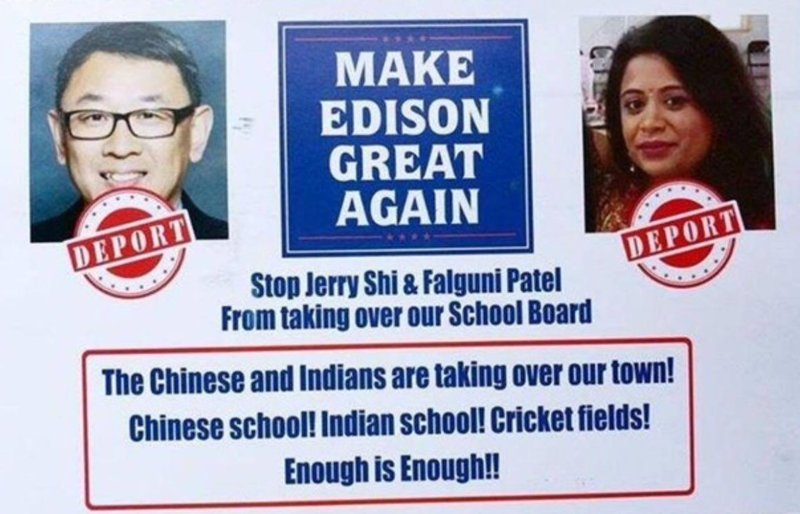 Meanwhile, in New Jersey, Kajal covered the anonymous mailer sent out to voters in Edison targeting two candidates for school board on the basis that cricket fields are an insult to American values. 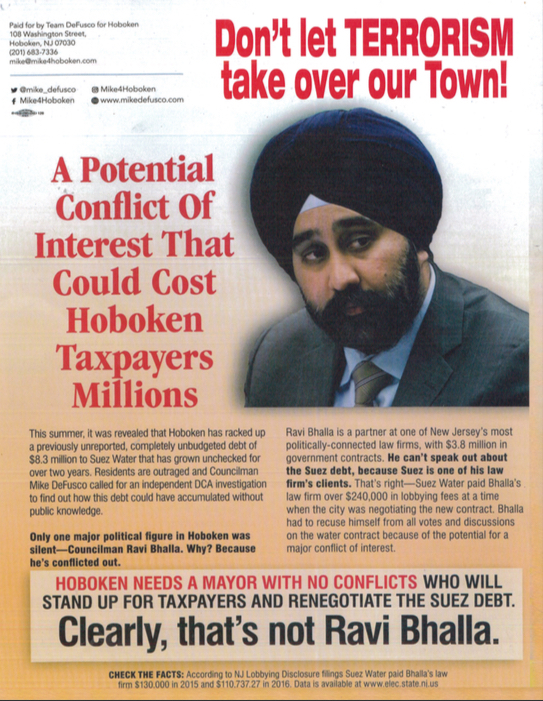 Days after the incident in Edison, flyers appeared in Hoboken, NJ using Islamophobic tactics to smear mayoral candidate Ravi Bhalla as a terrorist; oddly enough, the accompanying text on the flyer criticizing him in detail had literally nothing to do with terrorism. Over the Hudson in New York City, mayoral candidate Bo Dietl also tried to gain votes by indulging in some Islamophobic rhetoric, questioning incumbent Bill de Blasio’s qualifications to protect the city when he hugs scary Muslims like Linda Sarsour. This list only covers some of the most egregious examples of racist campaigning this election cycle, but there are sure to be many more instances that escaped media attention. Lucky for American voters, there’s sure to be more of this garbage to look forward to when the 2018 midterm elections roll around.